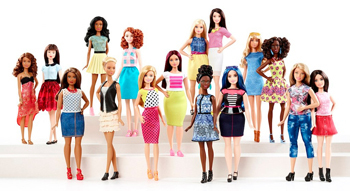 Mattel's Barbie Doll collection for aimed primarily at girls is getting its biggest makeover since 1959. Obviously they've had numerous private makeovers by young girls for decades, but this time it's in public. So what you might say, but it's got a number of right-on wadicals rather dizzy with excitement and all of a flutter. What's the big issue that's being addressed with a more diverse product range of dolls? And why can't some grown-ups just let go of the inanimate plastic barbies? As the youngest of four boys in a loving but relatively poor family, I never had any of my own dolls. In fact I never even had my own teddy bear, or clothes for that matter, wearing a series of hand me downs that were patched and darned such that it was sometimes hard to tell what the original item would have looked like. After mithering my parents for my own teddy bear throughout my teenage years - I don't think I realised I should have had my own before then - they finally bought me one on my 18th birthday. At last I understood what shape and colour I should aspire to be. My sister on the other hand, being the baby of the family and the only girl was lavished with all her own clothes, new ones, and all her own toys rather than what was left of the out of fashion one handed down to me. I'm not bitter. In truth, I quite liked the fact that I had to work for and earn the things I wanted for myself, and getting out delivering papers and later, caddying for the posh people at weekends helped me appreciate the real value of useful things. Spending money of Mattel's Barbie Dolls would have seemed a waste. 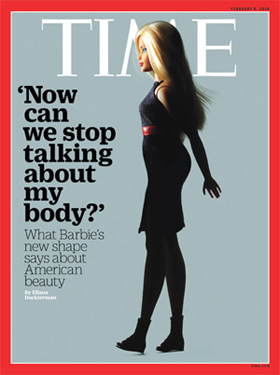 So how did the Barbie Doll makeover make it out of ironic articles in the fashion pages and onto the more serious and political pages and programs? Jess Cartner-Morley deals with the ironic approach quite nicely when taking sounding across the fashion team at the Guardian when she writes "With four body shapes, seven skin tones, 24 hairstyles and 22 eye colours, Mattel’s new Fashionistas range has expanded the options for its famous dolls" followed up by "The full range now has four body shapes, seven skin tones, 24 hairstyles, 22 eye colours – who knew there even were 22 eye colours? – and feet that can wear trainers as well as high heels. What next: Barbie with flat hair?" It's when it gets all serious and faux political that the irony becomes comedic, albeit in a tragic way. For example, in the Guardian also, Hannah Ellis-Petersen article is delightfully entitled Barbie finally becomes a real woman, where she quotes the YMCA's Be Real campaign spokesman as saying "We know that children are affected from a young age by the images around them. We have research that says girls as young as five years old are worried about the way they look and their size. More so than ever, everywhere they go young people are bombarded with images of photoshopped women, who have shapes that are just not real and not healthy and that is a big issue for us." That the YMCA has a campaign on dolls called Be Real is laughable enough, but to seriously employ people to 'work with schools and corporations' on the issue, saying 'it was about time that companies accepted responsibility for the images that they projected onto young girls and teenagers' is it any wonder some girls and teenager may be over interested in the body image? This unhealthy obsession with dolls by adults speaks of a profoundly detached and fetishised sense of the capacity of adults to shape their own lives and world around them. To posit any sense of inadequacy to make it in the world today onto the shape, colour, hair length or clothes of a doll they or someone else had when they were young is an admission that those vocalising it have lost the plot. Such campaigns may give an alienated middle class and their wannabes a sense of purpose but it will surely do nothing to help them do anything useful or productive in society. The only thing worse than adults getting all nostalgic for the days they played with dolls is the heaping of adult purposeless onto children who should be left to play and find out how they can best interact with their peers on their journey through life. The first thing I did with my very own teddy bear was string it up by its own ribbon and drip sacrificial ketchup down its neck - maybe harsh, and a tad childish on reflection, but a recognition that I was leaving the world of dolls behind and yearning for my adult life. Let children have a childhood and grow up without warped and disappointed adults having to dump all their own anxieties and empty headed vain politics onto them. Playing with dolls is a childish activity of make-believe not a social constructivist activity to be managed by thought police.